AS AMERICANS STRUGGLES through the Great Depression, groups paraded with signs telling blacks, “Go back to the cotton fields—city jobs are for white men.” It was the summer of 1939, a few weeks before the outbreak of World War II. Seventy-six years had passed since the Emancipation Proclamation, but in many places separate drinking fountains still existed for blacks and whites. That year, black preacher Marshall Keeble declared his own war—not on racism, but on sin and sectarianism. 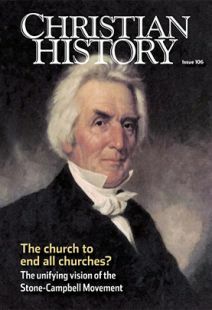 Collaborating with his faithful song-leader, William Lee, Keeble began a campaign in Hungtington, West Virginia, that resulted in eight baptisms. Marshall Keeble appealed to whites and blacks across the Jim Crow South, his audiences in some places consisting mainly of whites. Keeble’s “power in the pulpit” derived from his story-centered preaching and practical illustrations. He had a humble, nonthreatening demeanor, and his homespun wisdom and wit kept his listeners coming back for more. Keeble was a native of Nashville, Tennessee. As a young man, he came under the spiritual influence of his father-in-law, Samuel Womack, and the social influence of Booker T. Washington (1856–1915). Keeble inherited his rigid exclusivism and high view of the church from Womack. From Washington, Keeble learned how to win the favor and finances of influential white leaders in the South, including his chief benefactor, insurance company founder A. M. Burton, who funded his preaching campaigns across the South and beyond. Significantly, Keeble would not have received such generous, enduring monetary support had he challenged the racial status quo, as did many of his black contemporaries in the pulpit, such as Samuel Robert Cassius and G. P. Bowser, and those in the social and political arena, such as Henry M. Turner (1834–1915) and W. E. B. Du Bois (1878–1963). Though Keeble hated to see fellow African Americans lynched and discriminated against, he refused to oppose white racism publicly. For Keeble, leading black people to heaven was more important than helping them achieve racial and social justice in this life. As complex as he was famous, Keeble understood his white contemporaries and supporters better than they understood him, and he left an indelible mark on Churches of Christ and on American society. His spiritual “sons”—Luke Miller, John Vaughner, and Lonnie Smith—evangelized thousands. He also had “grandsons,” young men who attended the Nashville Christian Institute, his K–12 school for black youth (1939–1967; groundbreaking pictured above).